Saturday, 27 Apr 2019 at 2:00 PM . "Ferocious Dog are the new noise on the block - and are surprising everyone with their rapid ascent. There is no way they're following any hipster templates - fronted by a big burly man with a mohican who sings impassioned political songs of broken Britain whilst his band seethes like a punky Levellers - they are the music business's worst nightmare - a great band who are going to make it without anyone's permission". 2016 was a defining year for Ferocious Dog. From playing Billy Bragg's Left Field stage at Glastonbury in front of a massive crowd, to sharing the stage with The Levellers on their sold out European and UK tour in November and December and many sold out shows in-between. Ferocious Dog left the audience under no doubt that they had witnessed a band that has the talent and passion to go on to dominate the folk/punk music scene.Ferocious Dogs 3rd studio album, The Red Album, was released November 2017 and received rave reviews. October 2018 also marked the release of "The Landscape Artist" - the first single taken from the forthcoming 4th studio album - "Fake News and Propaganda".
" 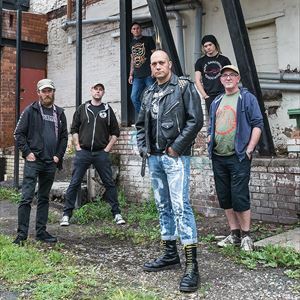 Without doubt Ferocious Dog are one of the best bands on the UK folk punk circuit as they brought Rock City to life with their stomping, energetic sound. Not only are they one of the most hardworking bands around, but as their fans will testify, they are also one of the most approachable "
Ferocious Dog offer a full-on six-piece sound that encompasses folk infused with rock, reggae and Celtic vibrations. The combination of instruments creates a palette of sound that offers infinite variations: going in hard to get the audience up and moving, or slipping into melodic passages and dub-like fusions. The songs are deeply personal and their fans can really identify with the words. Dan Booth, on fiddle, and John Leonard, playing just about everything with strings, bring a huge amount of intricacy to the breakneck pace of their songs. Les Carter (ex Carter USM) on guitar and the rhythm section of Alex Smith and John Alexander hold things together brilliantly, and with Ken Bonsall's lyrics and sheer likability, you have a whole greater than the sum of its parts. Ferocious Dog are well known and popular for their high octane live performances.